I’ve been trying to get some inspiration for running a con suite, hospitality suite, whatever you want to call it, for CoreCon 2012, but with little luck. When I Google these keywords I don’t get many useful hits. 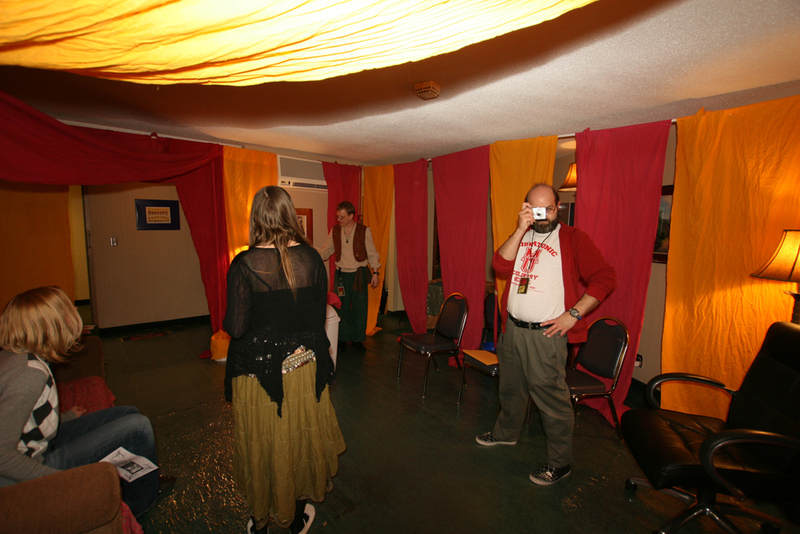 So in the interest of community service I’m going to blog about the suite that The KEEP put together for CoreCon 2011, in case anyone else out there is looking for ideas. The KEEP (Karen, Eric, Erica, Paul) hosted our first ever suite this year and I think we learned a lot from the experience. And it was a total blast. We sort of went halvsies on Friday and Saturday nights. CoreCon’s theme for 2011 was “Myth and Magic.” In the spirit of this theme we chose “Tea and Tarot” for Friday. As the name implies, we served tea and did free Tarot readings. On Saturday we ran “Sword and Sorcery Sinema” which, once again, speaks for itself. Then again, after seeing Lou Ferrigno throw a bear into outer space, maybe it doesn’t. 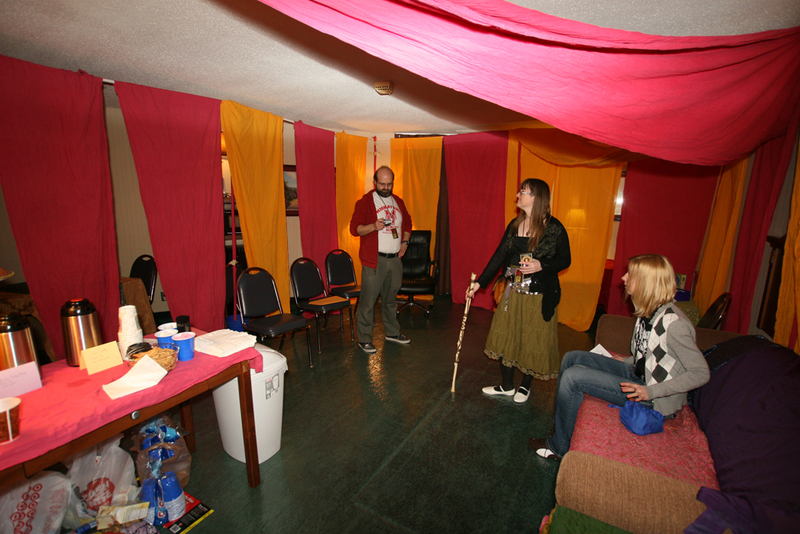 We came up with the idea of a circus sideshow tent theme for the room decor. This required a lot of engineering. We ultimately built a rectangular frame out of 1/2 inch PVC pipe and draped it with muslin. We dyed the muslin (two 50-yard bolts) red and gold. It seemed to fit both circus and movie theatre ideas. We had originally planned to plant the upright supports in buckets filled with sand or gravel, but once we set it up another solution presented itself: we tied some supports to chairs and also used the loveseat in the room to keep everything sturdy and in place. Additional support was provided by masking tape. We had originally thought we’d drape very long lengths of muslin all the way across the top to make the room seem more tent-like, but the weight of the fabric was too much and we had to modify the plan. Half-inch PVC is very bendy. We draped two lengths diagonally across the top. I think it actually worked out really well. We also used a lot of large safety pins to keep everything in place. One of the best things we had was silicon tape, which we used to keep the pipes in place on the joints. That stuff rules! Additionally, for Friday we put posters on the wall that were printouts of vintage circus posters from circusmuseum.nl. Doing this on the cheap, I covered some foamcore boards with decorative wrapping paper (blue and gold, alternating) and then used double-sided tape to attach the 8.5 x 11 prints I’d run off with my Canon printer (which ran out of ink just as I was doing this of course!). On Saturday, Karen and Eric replaced them with movie posters. There are some really good resources online for that stuff. To our surprise, we got the most compliments on our floor. At CONvergence 2010 we attended a panel about running con suites. One recommendation made was to buy self-adhesive painter’s plastic for the floor to protect against spills. As renters of the room we are responsible for paying for any damages. I think the plastic paid for itself almost immediately when, while having dinner before we opened, a slice of pizza took a dive onto the floor. Thanks to the great advice we received, it was a non-issue. One issue we had to overcome was the shape of the room. Even when we got dimensions and a drawing we really had to check it out for ourselves. It was really a strange shape – I think it had 6 or 7 different angles, plus a small entry way. This ended up working out OK because when we made the frame a rectangle it left small alcoves we could use for private Tarot readings. On Saturday we removed one section of the frame and set up a movie screen in its place. The CoreCon volunteers did a LOT to make our lives easier during the con. 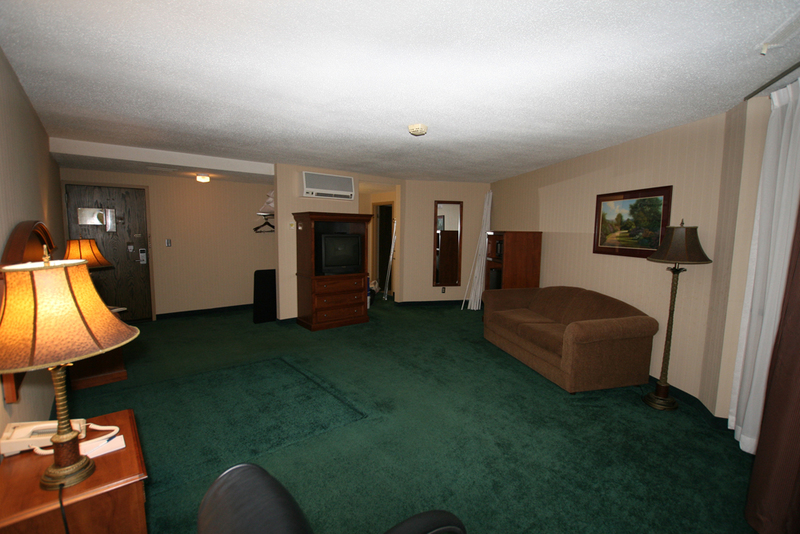 When we arrived the king size bed had already been removed. That was a huge help! Then they provided trash cans and bags and came around to empty them regularly. Less for us to worry about! We are very grateful for the support we got from CoreCon organizers. Overall I’m pretty happy with how everything turned out. The main thing I think we should do differently for next year is to have more variety of snacks. We mostly had animal crackers (circus theme) and popcorn along with our tea and Kool-Aid. I don’t think we’ll ever do alcohol. There’s just too much expense and risk involved in that. 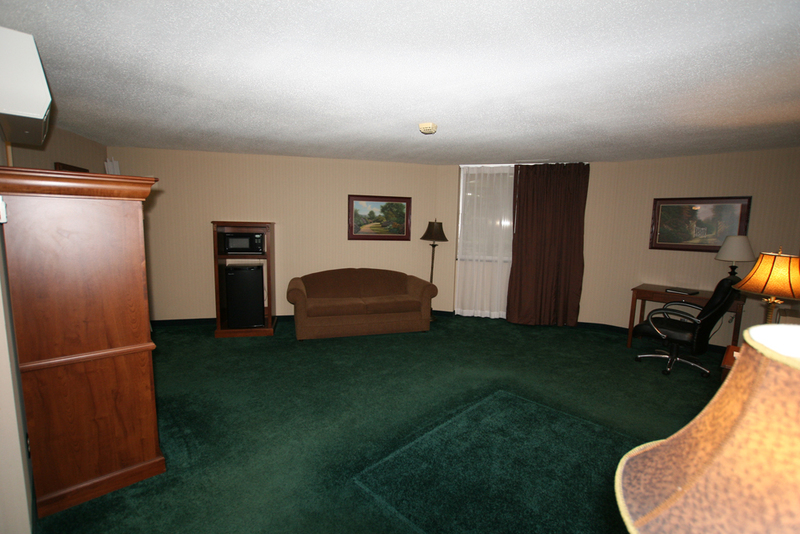 Besides, there are plenty of other rooms who already have that covered. So next year’s Con theme is The Apocalypse. We plan on working within that theme, but are not sure where to go with it. So far our Friday plan ideas (nothing in stone here) are Thundarr’s Cabaret, or The Atomic Church of Vectron. The main problem here is that the only things I know how to do in terms of entertaining others are bellydancing and Tarot reading. Thundarr’s Cabaret would require us to recruit a number of other reliable people. Any suggestions? Lay them on me!